Well, at least I thought it was a good joke. And it speaks to a certain truth: humans generally are obsessed with organizing and putting things into categories. It is evident in the way we divide our music into genres (“Is this chillwave or witch house?”) or put our pants in a different drawer than our shirts. This may seem silly, but, with our consciousness and perception, we need to categorize in order to make sense of our world, to generalize, and, well, to help us find things. We no longer have unicorns in our taxonomical literature. From the Ashmole Bestiary, 1504. Via BibliOdyssey. Long before any ideas of natural selection and evolution as we know them now, people were trying to organize the natural world around them. In 350 BCE, Aristotle published his History of Animals, which attempted to categorize the various “natures” of animals based on their characteristics. For example, he identified what we now know as arthropods as animals that do not have blood and, “if they have feet, have many” (French 1994). Some of his categorizations were not so on-par; for example, he placed foxes and snakes in the same category because they both burrow underground and thus have “sympathetic natures.” Accurate or not, the effort is there: making sense of the world through categorization. Although we’ve been at it for a long time, we are not close to being finished identifying all extant species, much less cataloging them. Just this week it was announced that, due to double-counts, the estimate of the number of flowering plant species will be cut by 600,000. 600,000! And those are just the plants that are living today, excluding all the known and unknown species that have gone extinct. It would be easy to say, “whatever, who cares about the extinct ones? If I’m categorizing to make sense of the world, I want to pay attention to the world I’m living in. Leave the past in the past, man!” But if people view the world as stories as I believe we do, we need this history of organisms to construct our narrative1. A basic illustration of the 3 domain system of taxonomy. The yellowish circles indicate the 3 nodes and the 3 domains of the Bacteria, Eukarya and Archaea. The Eukarya and Archaea share a common ancestor but evolved separately from there. Not to scale in terms of time or breadth. Drawn by Hannah Waters. And, in particular, we need to know the history of our own species: where do we fit into the puzzle? How far back can we trace our own ancestors? When I was 14, I was taught that we are part of the Animal Kingdom, one of the five kingdoms of life. When I was 17, I was instead taught the three domain system: the Bacteria, the Archaea, and the Eukarya, a classification developed by the microbiologist Carl Woese in the late 1970s. This new system organized the world based on cell type, in particular dividing the Monera, which previously described all single-celled life, into the Bacteria and the Archaea, which are each single-celled but have many differences in structure. (See this great post by Labrat for more information on their distinction.) No longer were we humans described as “animals” as in ancient times, but rather based on an ancient ancestor, the first to embody the type of cell that makes up our bodies. 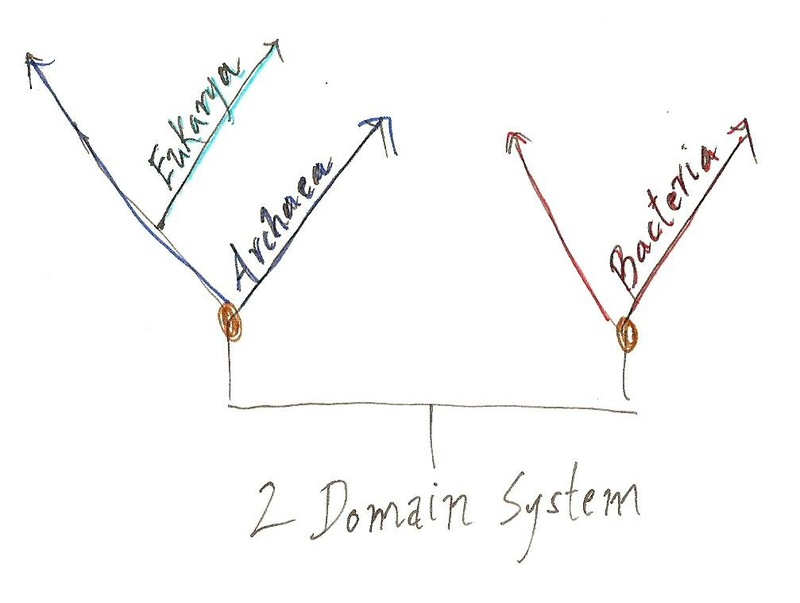 In the three-domain system, we eukaryotes are more closely related to the archaea, but evolved separately from a common ancestor (sister lineages). We evolved a unique nucleus composed of specific proteins, and later acquired mitochondria or plastids from bacteria through endosymbiosis. However, a different hypothesis has arisen in the past couple of decades: the 2-domain system. In this system, the Eukarya are even more closely related to the Archaea. In fact, we are a subgroup, having evolved from a singular lineage within the Archaea. A mere secondary domain, replacing Eukarya as a “primary domain” or sister lineage as put forth in the 3-domain system. A basic illustration of the 2 domain system of taxonomy. The yellowish circles indicate the 2 nodes and the 2 domains of the Bacteria and Archaea. Of note is that the Eukarya evolved from the Archaean domain. Not to scale in terms of time or breadth. Drawn by Hannah Waters. Why is the 2-domain system being considered at all? The Archaea and Eukarya share many of the same components of their genetic information systems, such as over 30 ribosomal proteins, RNA polymerases, transciption factors, promoters to initiate transcription of the genome, and replication enzymes (Gribaldo et al. 2010). A general tenet of constructing phylogenies, evolutionary trees through time, is that the simpler answer is usually better. Proponents of the 2-domain system argue that it is simpler for these genetic pathways to have evolved once in the older domain, the Archaea, and been retained in the newer subdomain, the Eukarya. 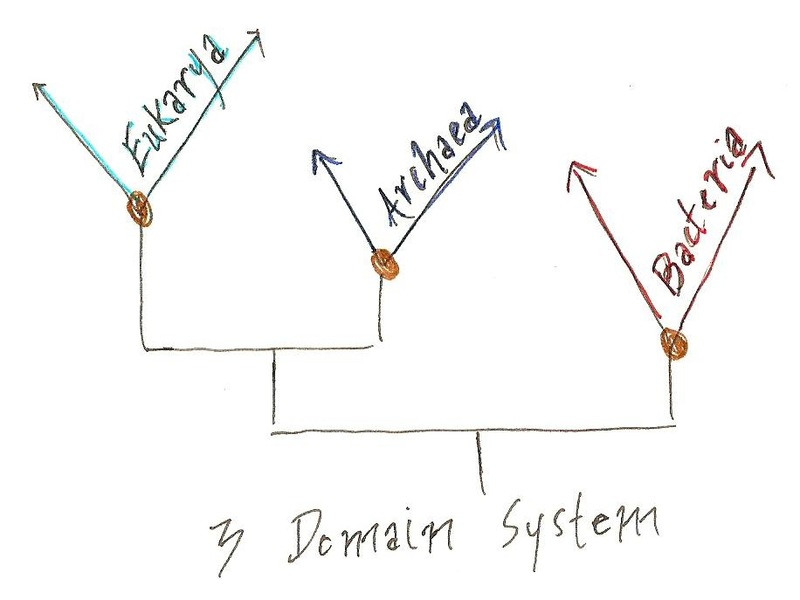 Proponents of the 3-domain system hold that these systems evolved earlier before the lineages split and were preserved in both the groups over time. The authors compared every gene in the yeast genome to bacterial and archaeal genomes, finding that 952 genes have bacterial homologues, while 216 show homology to archaeal genes. Using these genes, they performed two main tests. First, they examined how frequently each of these genes killed the cell when deleted from the genome – a test to see just how imperative each is to the cell’s survival. They found that lethal genes are twice as likely to be of archaeal origin than bacterial origin, giving the Archaea one “important point” in their book. Second, they looked at how frequently these genes were actually transcribed, or copied into a form from which they can be made into proteins. Using RNAseq, they found that there was significantly more expression of genes with archaeal homologues than bacterial. Another “important point” for Archaea. This study seems to support the 2-domain hypothesis: the genes that come from Archaea are used more frequently and are more necessary for cell survival, despite being fewer in number than Bacterial genes. But remember: both systems of taxonomy support the idea that Eukarya are more closely related to Archaea. Importance is merely a factor of correlation, not evolutionary causation. It provides evidence that the two domains are related, but not the direct evolution of Eukarya from the line of Archaea. More than anything, the fact that this debate exists in the first place gives us a great perspective on our story. Under 2500 years ago, Aristotle categorized foxes and snakes together. Now, we’re splitting hairs over the type of ancient cell that foxes, snakes, and ourselves evolved from over 2.5 billion years ago. It provides the history of our progress. And look how far we’ve come! 1 Of course there are many applications for studying evolution beyond a desire to learn about our own history. This 2005 interview with Massimo Pigliucci, an evolutionary biologist at SUNY Stony Brook, and the 1998 collective paper “Evolution, Science and Society: Evolutionary Biology and the National Research Agenda” are good places to start. NOTE: Molecular evolution is incredibly hard to explain (in my opinion), and I did my best to do so in English. If you have any questions or think some parts need clarification, please let me know in the comments or write me at hannah.waters [at] gmail.com. I’d really appreciate it! Thanks! French, Roger. Ancient Natural History. New York: Routledge, 1994. Introducing… Sleeping with the Fishes! I’m excited to announce a new Hannah Waters production: a marine ecology blog on the Southern Fried Science Network called Sleeping with the Fishes! I know what you’re thinking. HANNAH, YOU’RE NOT THAT COOL! DO YOU REALLY NEED 2 BLOGS? WHO THE HELL DO YOU THINK YOU ARE? WHAT IS THE DEAL?!? It seems a bit excessive, I know. But give me a second to explain myself, OK? You may know that the science blogosphere is changing, and that the people at the top are working to create and manage a number of networks, and then to network those networks. While independent bloggers are still perfectly acceptable and welcome (Culturing Science will remain independent unless something totally irresistible pops up. ), I do like the idea of these networks. It promotes community between us bloggers and scientists, and could help to increase visibility to science blogs generally and thus promote science education and the sharing of knowledge. Despite offers, I’ve put a lot of thought into decisions to join (or not join) various networks. I want to join one(s) that feel right to me, communities that fit my goals and my style. I would never join a network solely for the increased exposure; that doesn’t feel right to me. The Southern Fried Science Network is a group of bloggers focusing mainly on marine science (with a few exceptions). When I got the offer from them, I was ecstatic. The idea of writing in a community of shared interest and thus trying to create a marine science stronghold on the web is an exciting prospect, and I want to be a part of it. As you know, I don’t only write about marine science on Culturing Science. Thus I created a new blog, to keep my writing on the SFSN focused, but also to retain an outlet for writing on other topics. It doesn’t mean I’m going to abandon this space; not by any means. That is just about all I can tell you because it’s all that I know. The rest will unfold with time. So come along and join me at Sleeping with the Fishes! I’m excited about this addition to the Hannah Waters brand (haha) and hope you are too. You should probably subscribe to the Sleeping with the Fishes RSS feed to stay up to date.